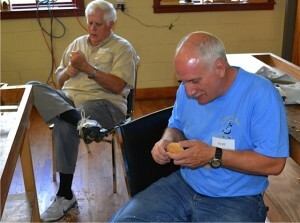 I went to Highland last weekend for a Saturday class on Spoon Making. I have made a few spoons over the years, mostly by trial and error, watching Roy Underhill and some other videos on the internet. 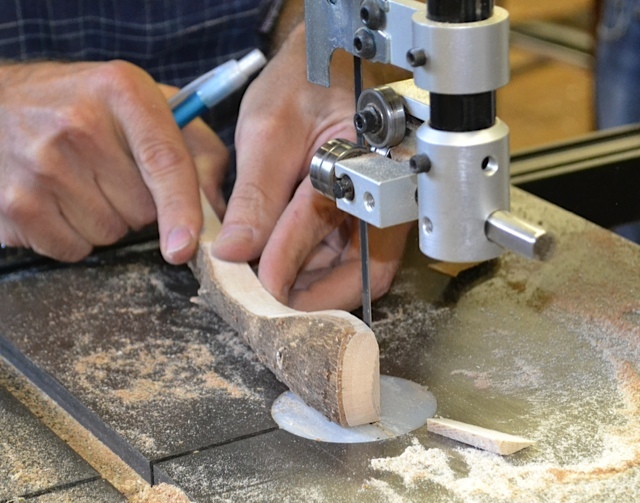 It is always funny to me there is a mythos about many kinds of woodworking and Spoon Making has its share. Generally speaking, you are pretty far down the handle if you use power tools. The really good makers have a large beat-up stump in the middle of a brick floor, use a small axe to get the initial shape, and a curved knife made by American Indians on an island in Puget Sound. The rest of us use whatever we have in the shop and knives we buy from Highland. When I tried my first spoon, I took an old piece of dried wood and started hacking at it with my small axe and then with whatever knives and chisels I had in the shop. It did not take me more than about two days of hacking to decide that the traditional methods were not for me. My style degenerated into seriously considering using my chain saw to hollow out the bowl. I figured if I could clamp the saw into my workbench vise with the chain facing my chest, then I could hollow the bowl by pressing the nose of the chain into the blank piece while holding it to my chest. Of course, I would be wearing my leather apron just in case it slipped away. (Do not try this at home, Ralph. You do understand sarcasm when you see it, right?!!) 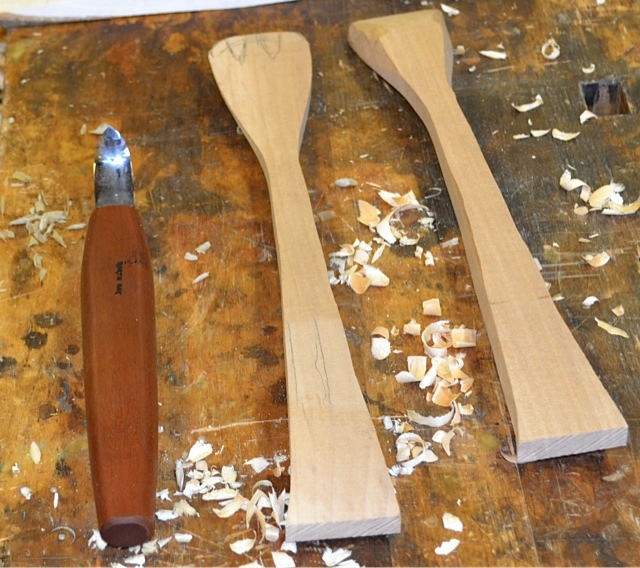 The point being that without the right tools and a little instruction, it is really easy to get tired and discouraged trying to make a spoon out of dry hardwood. Our instructor, Jay Hallinan, met us at Highland early on Saturday and introduced our little group to the art of Spoons. Turns out there is more to spoons than you ever thought about. The shape of the bowl, the shape of the handle, the shape of the end of the spoon to fit into a pot for stirring, all are more involved than you would think. For instance, an eating spoon must be shaped so that when you put food in your mouth, you don’t have to scrape the bottom of the bowl with your teeth to use it. Jay showed us some salad spoons, larger than eating spoons, which were too heavy on the handle end and tended to tilt out of the salad bowl flipping lettuce all over the table. Who would have thought? We went over tools and sharpening. The best primary tool is the curved knife. Used upside down so the blade comes out the bottom of the hand and with the thumb on the end of the handle for leverage, it is surprisingly effective in hollowing the bowl. One of the best things I learned from the class is that the shape of the spoon does not have to be symmetrical. You know me, Mr Engineer, I want things to be parallel and perpendicular, but who cares if the handle is curved. The issue is how it feels in the hand and how it eats and how it stirs and your name on the back of the handle. We used soft wood to do our spoons so no one would get discouraged with the difficulty of the carving and whittling. Our first spoons were made from blanks Jay had prepared for us beforehand. After that, we had plenty of scraps and fire wood we could choose from and begin to make another. And the point is just that — you can use scraps, fire wood, found wood, fallen limbs and shrub trimmings to make a spoon. Many people sit around and spread a cloth on the floor to keep the spouse happy and carve away while watching TV or listening to music. All in all, it was an excellent class. Coming to the Seminar Room at Highland is like coming home. The workbench at the front of the class is signed by instructors who have taught there and you will recognize many of them. 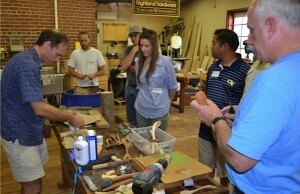 The best thing about it is the camaraderie of like-minded people who come to learn a new old skill. I am always pleased to have classmates ask about some other class I’ve taken or some blog I read that they have not yet discovered. We all go to lunch together to one of the bars next door and the instructor generally goes along with us. 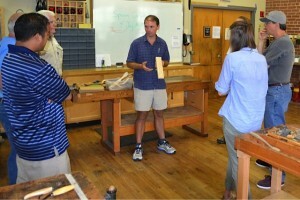 And on the way back from lunch you can shop in Highland Woodworking and buy a basic tool kit for making spoons. You can even get the address of the guy in Puget Sound.